This is my famous hodge podge sauce. 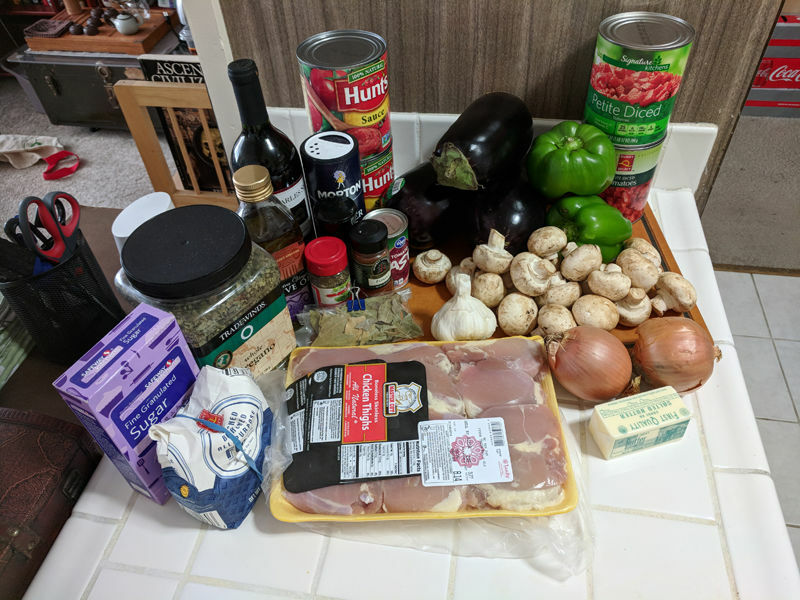 It started as a combination of chicken cacciatore and pasta alla norma, but has since taken on a life of its own. I basically lived on this sauce as my primary diet for a few years. 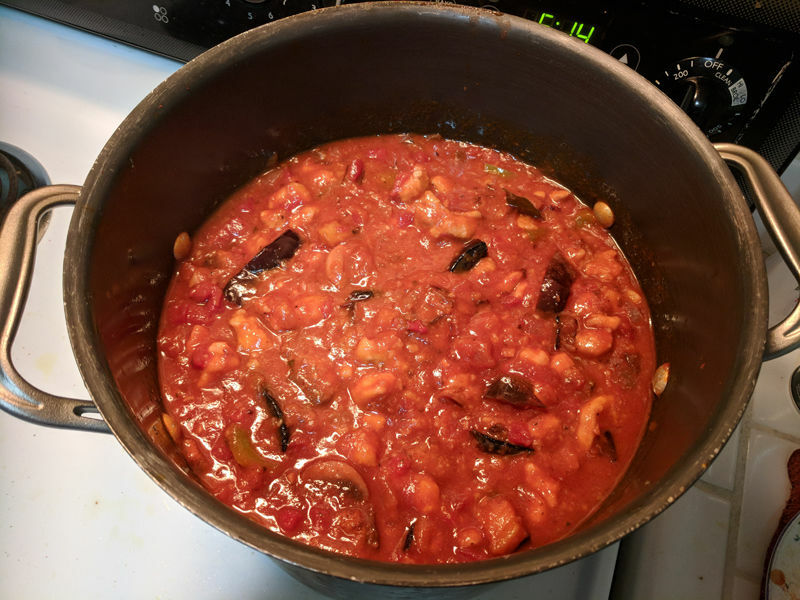 The biggest take-away is to try making an eggplant and tomato sauce. 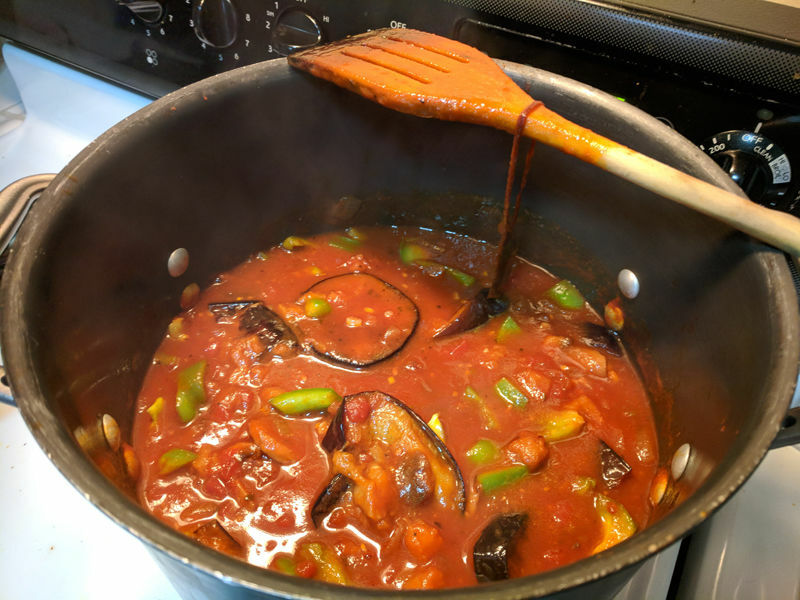 If you sauté eggplant slices and add it to a tomato sauce, the eggplant will completely dissolve and blend into the tomato sauce. It creates a very thick sauce that tastes great. Cook time: 4 hours of active cooking, then another 2 hours of simmering while mixing every 20 minutes. Plus about 30 minutes packing it into containers. Experience level: Intuitive. You should have an understanding of what you like in food and feel comfortable adjusting recipes to fit your tastes. 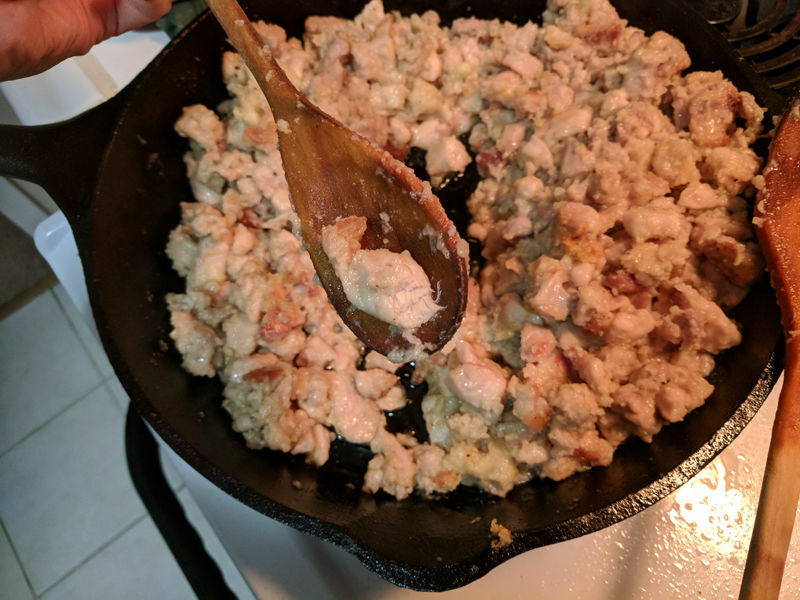 Make it vegan: Remove the chicken and butter, and it still tastes just as great! Make it gluten-free: Don't put flour on the chicken, and serve over rice noodles (I actually only eat rice noodles these days). Note: Adjustments will occasionally be made to this page as I figure out better ways to do things. If you follow the suggested quantities, you'll be able to feed a single person for a month, or a family of 4 for a week. I cook this dish entirely by eye and taste. 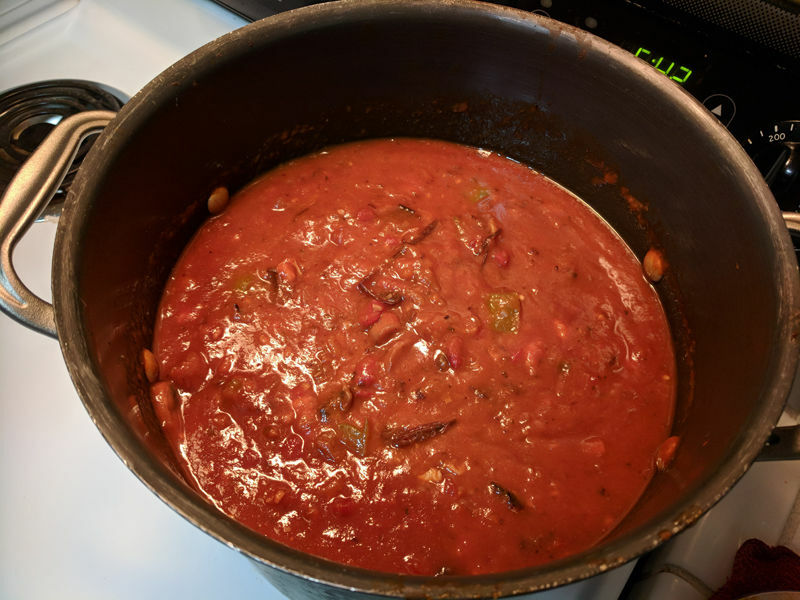 I like a thick, meaty sauce so I adjust the tomato sauce and various meaty ingredients until it looks just about right. After it has boiled at the end of assembling everything, I will taste it and adjust ingredients as needed. See the troubleshooting section for how I decide upon adjustments. The order is designed to minimize cook time, minimize washing dishes, and avoid spreading contamination from the chicken. Keep using the same cutting board and sauté pan for each step. The sauce will splatter when boiling. Use a lid and a very tall pot. Before removing the lid or sticking your hand in to mix it, lower the temperature for a few minutes to minimize splattering and protect your hand from burns. Put the tomato sauce and diced tomatoes into the large pot. Add in the spices. I usually put a thin layer across the entire top of the sauce then mix it in. 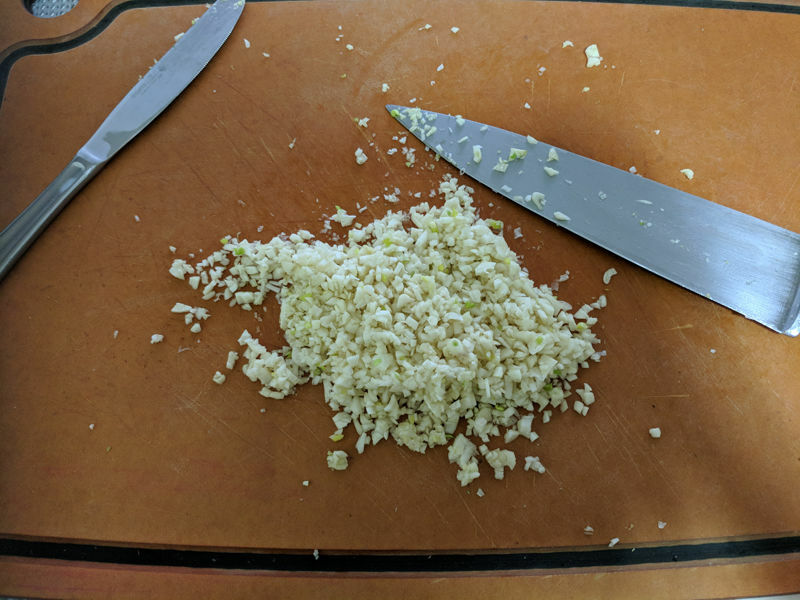 Dice an entire bulb of garlic. The more garlic the better. The garlic permeates into the sauce better when there is more cut surface area, so dice it up as finely as you can manage. Sauté the garlic in olive oil on low heat. It can be easy to burn, so carefully watch as it cooks. Pour all of the garlic and olive oil into the sauce. The olive oil will have absorbed the garlic flavor. 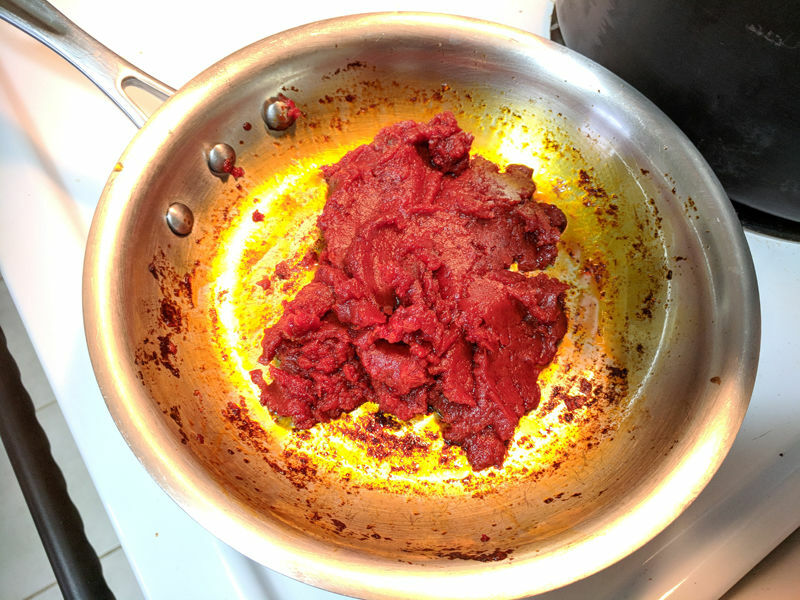 Sauté the tomato paste with olive oil. It takes a long time to caramelize the paste, so I use a separate pan and check on it frequently and stir it. Add more olive oil as needed so that it doesn't burn to the pan. 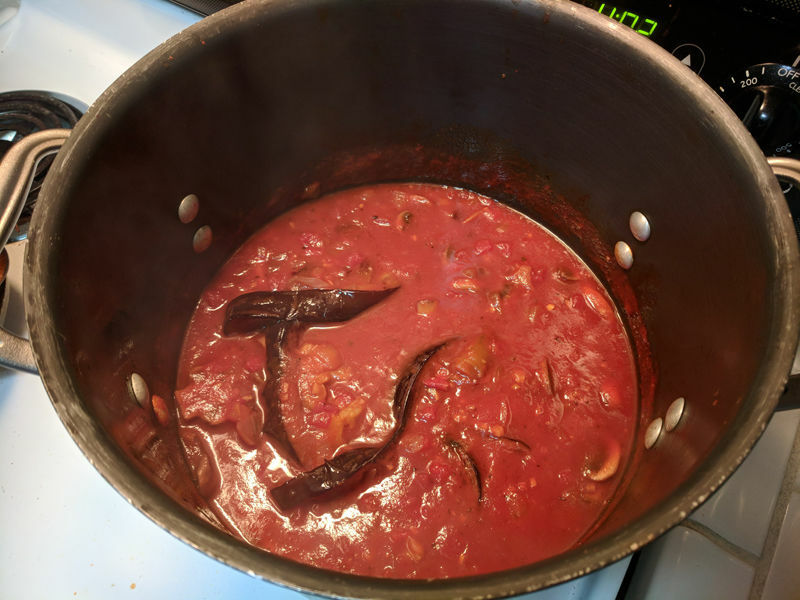 The tomato paste is caramelized once it has turned darker and starts clumping together. Don't skimp on this step. 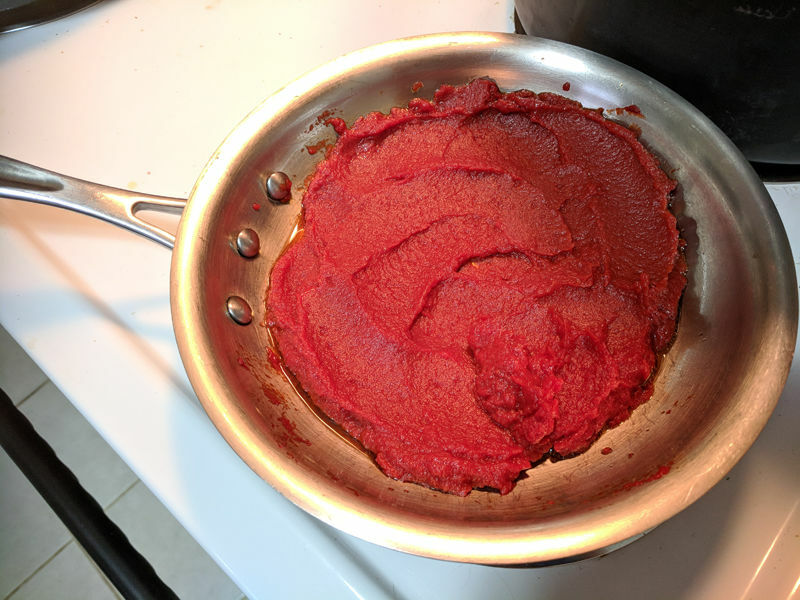 Non-caramelized paste will make the sauce extremely tart, while properly caramelized paste will mellow out the flavor. If in doubt, sauté it a little longer. Slice the mushrooms and onion. 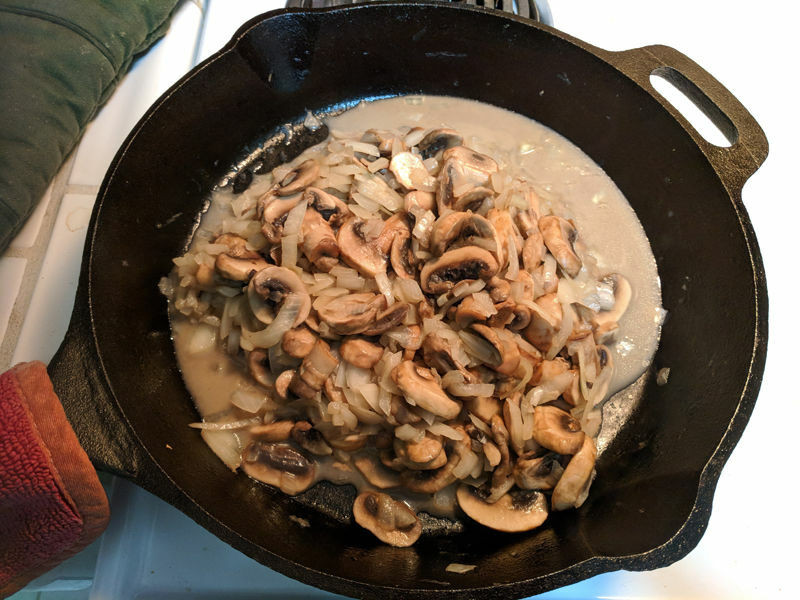 Melt some butter in the sauté pan then add the mushrooms and onion. I usually use about 2 tablespoons of butter. 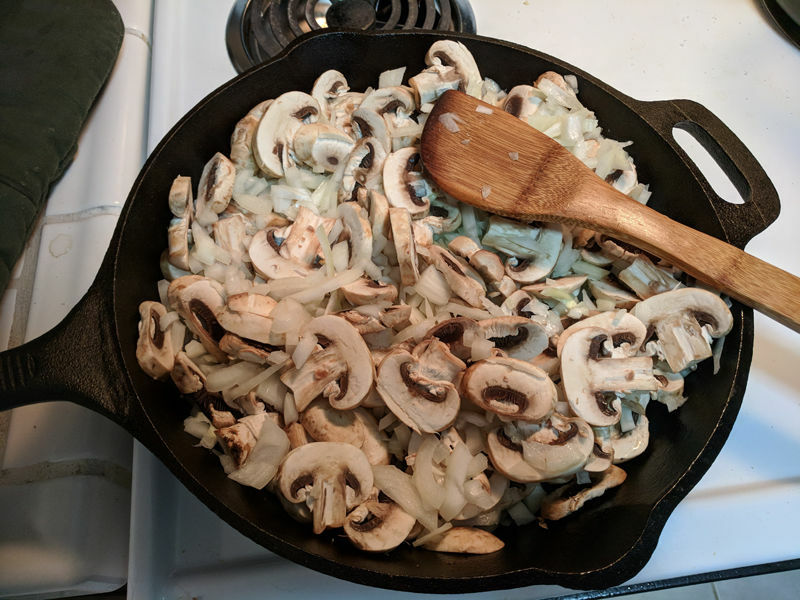 Continue to sauté until the juices come out of the mushrooms and onions. This is very important. There are natural sugars in the juices which is critical to mellow out the taste of the sauce. Pour the mixture and all of the juices into the sauce. 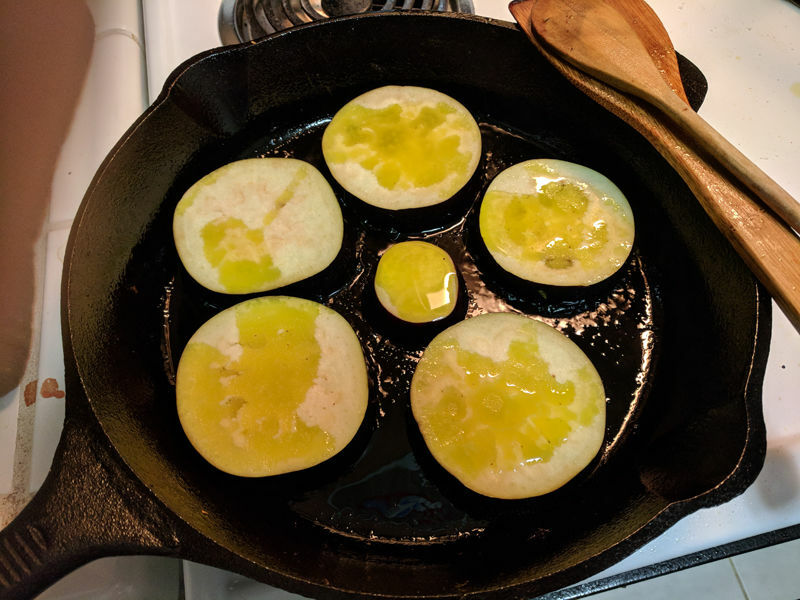 Slice the eggplant about 1/2" and arrange in the sauté pan with add olive oil. 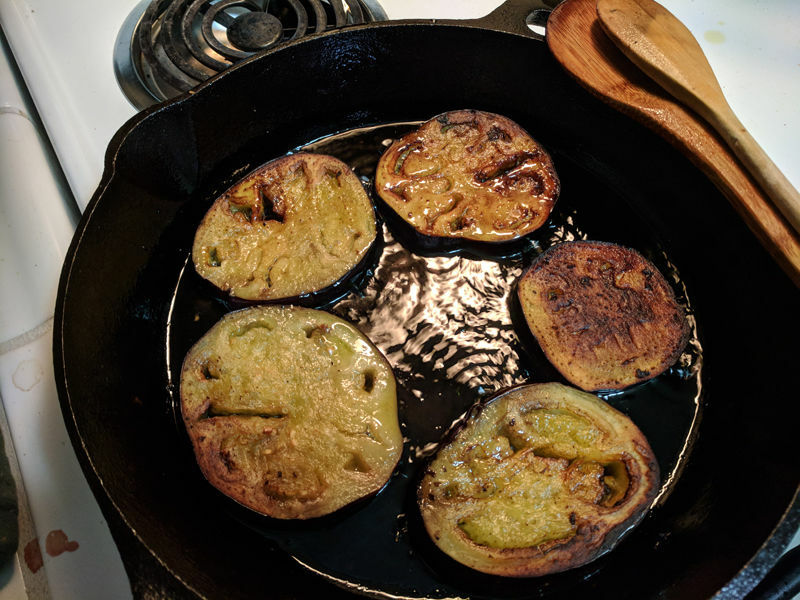 The eggplant is hungry for olive oil. It will completely soak up the olive oil several times. If you don't want that much olive oil in the sauce, then try baking the eggplant before adding it to the sauce. 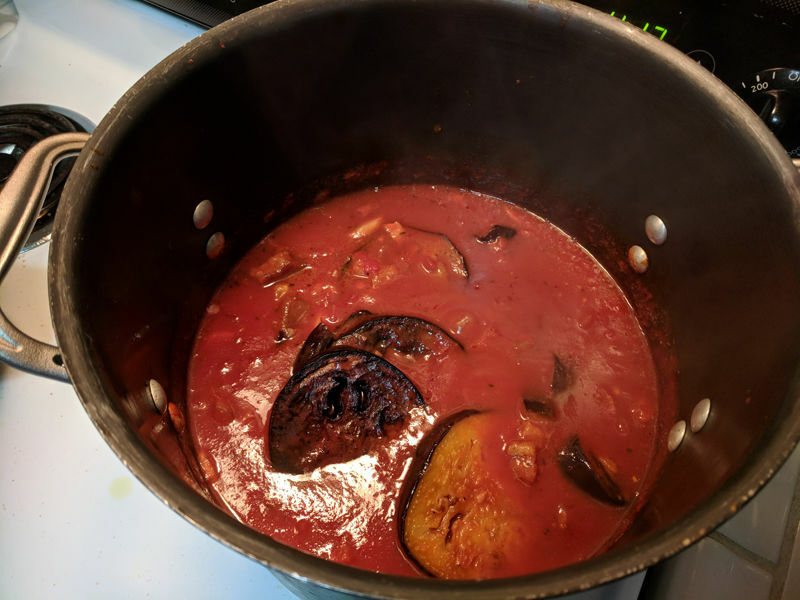 Don't put raw eggplant directly into the sauce: it won't dissolve in the sauce. Flip the eggplant slices every few minutes. Keep sautéing and flipping the slices until they are toasted, soft, and flexible. 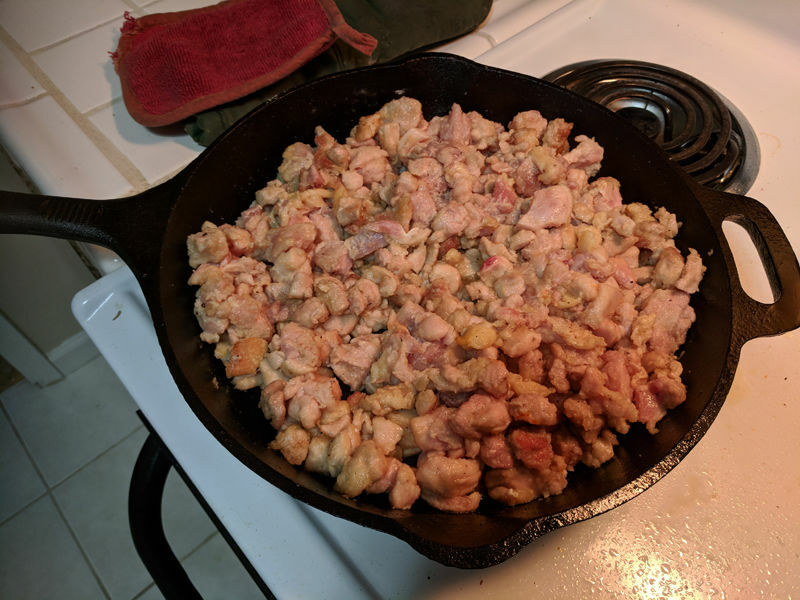 In the photo above, the ones on the right are done, while the ones on the left need to be cooked a little longer. Don't worry if you burn them. I burn them all the time and put them in the sauce anyway. 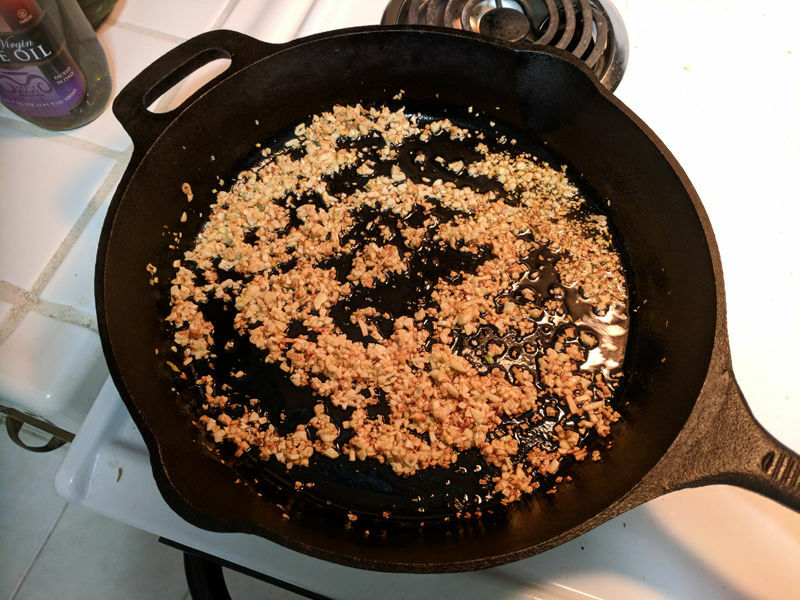 A cast iron pan will cook it much faster. Consider using multiple pans if you have access to more because this is the longest, most boring part of the recipe. 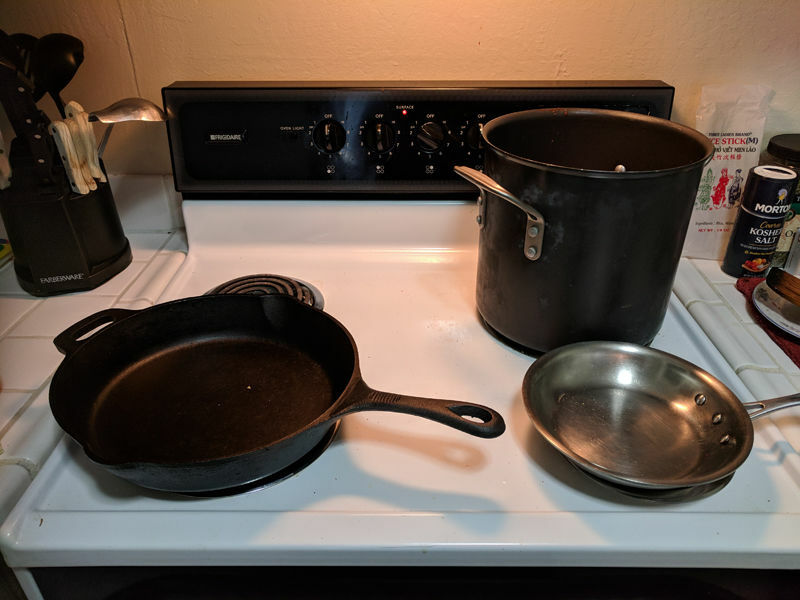 Each pan-full takes about 15 minutes to cook. Once toasted on both sides, add the slices to the top of the sauce and let them sit so they further soften. Mix them into the sauce after a few minutes. Keep repeating until all the eggplant slices have been sautéd and added to the sauce. Over time the eggplant will just dissolve and leave the skin behind. Even the skin will continue to thin out and dissolve into the sauce. Keep mixing regularly to facilitate this process. The strings of eggplant skin are edible and provide additional nutrition, but they can turn people off. Some people will separate the skins from their meal and leave them on the side of their plates If you don't want the skins, try picking them out as you stir the sauce (picking them out when the eggplant is half dissolved is easiest). 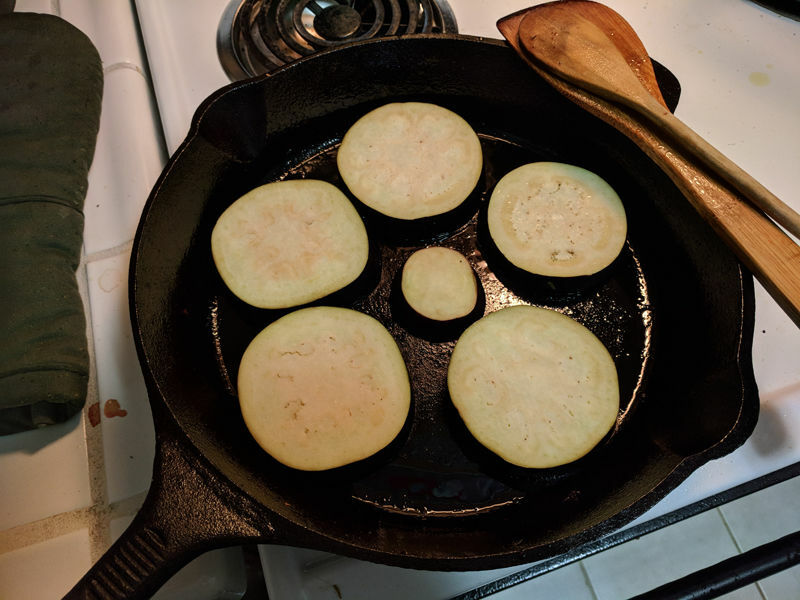 You can try peeling the eggplant before cooking, but I found it makes it more difficult to sauté and flip the eggplant slices. Cut up the green pepper into bite sized pieces and mix it into the sauce. I use a green pepper for contrasting color. Use whichever pepper you like best. Also consider celery. I add in the green pepper at this later stage to keep it more crispy. Add in about 4 servings of red wine. The wine is important for mellowing out the sauce, so don't be too stingy. I've actually added up to a bottle and a half of wine when trying to work out a tart flavor! (So... buy really cheap wine) I think adding the wine later in the process makes it more effective for countering a tart flavor. Note the string of eggplant skin hanging off the handle. This will happen often, but the skins will get thinner and smaller the longer the sauce simmers. 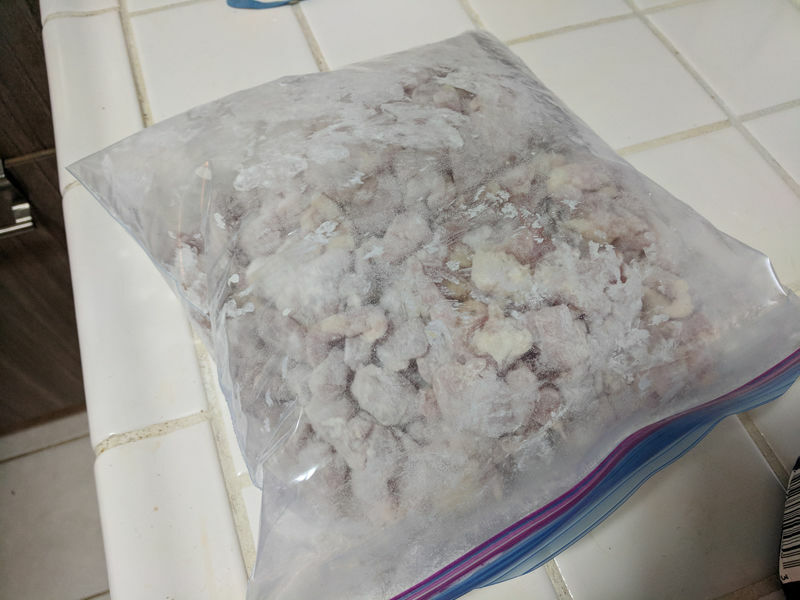 Cut up the chicken into bite-sized pieces and put into a large plastic bag. Chicken thighs are best for a tomato sauce as they are more tender and have additional intrinsic flavor. But feel free to use any chicken type you prefer. Add some flour 1/8 cup at a time along with some salt and pepper. I zip up most of the bag then blow in some air before sealing it to give the chicken room to move around. Shake well. Add more flour, salt, and pepper until the chicken is thickly coated. Add the chicken to the sauté pan with some olive oil as nneeded. Sauté until chicken is lightly toasted. Add a lid to the pan to make it easier to cook all of it more evenly. Cut a large piece in half and make sure it is white. The goal is to have moist tender chicken that is white in the middle. Pour in the chicken and mix it into the sauce. After adding the chicken, put on a lid and bring the sauce to a boil for 20 minutes. Lower the temperature before removing the lid so you don't burn your hand (I speak from experience), wait a few minutes for it to stop boiling then thoroughly mix. Set it to simmer and mix it every 20 minutes so that the sauce doesn't stick to the bottom of the pot. Simmering time depends upon your preference. The longer it simmers, the more the ingredients dissolve into the sauce. I usually simmer for one hour after the initial boil before serving, then let it continue to simmer during dinner. 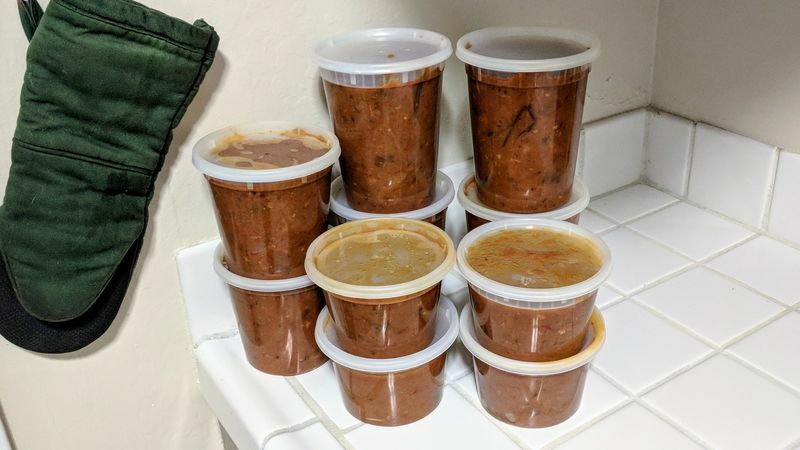 After dinner I'll turn off the heat and let it cool for 2-3 hours before putting into containers (OK, in reality I'm exhausted by that point and stick it into the fridge and put it into containers a day or two later). I taste the sauce every 20 minutes and make changes according to the troubleshooting section to adjust the sauce. Generally my goal is to get the sauce to be less tart, so I add more sugar and wine to compensate. I much prefer this sauce served with a string spaghetti than a different type of pasta (like penne or bow ties). 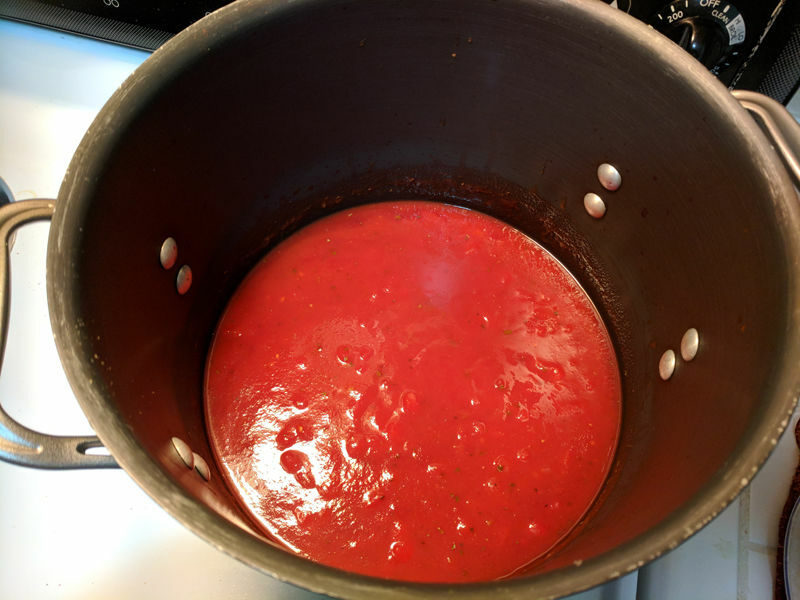 Put about a cup of sauce over each serving of pasta. Don't forget the parmesan cheese. The entire point of the recipe is about the leftovers! Although I did have a system of making this one-serving at a time back in college, I now make this once a month and eat the leftovers for the whole month. Saves a lot of time cooking throughout the month! Spoon the sauce into containers. Keep about a week's worth in the fridge, and put the rest in the freezer. Put a frozen container into the fridge about a day or two before you'll need it. I eat the left over sauce by putting 3 heaping tablespoons of sauce onto a plate and microwave it for 1 minute on high. I put freshly cooked pasta on top of the sauce, mix it up, and serve. Keep tasting the sauce every time you mix it during the final simmering period. Make adjustments as needed so that the sauce tastes just right. Tartness is the biggest problem. It should taste mellow and feel comforting. Try adding more wine or sugar. Let simmer for another 20 minutes and test it again. Additional mushrooms may help, too. Sauté them longer than usual so they get very small to extract as much of the juices as possible. Add the mushrooms and juices to the sauce. Believe it or not, it's possible to save a burned sauce! 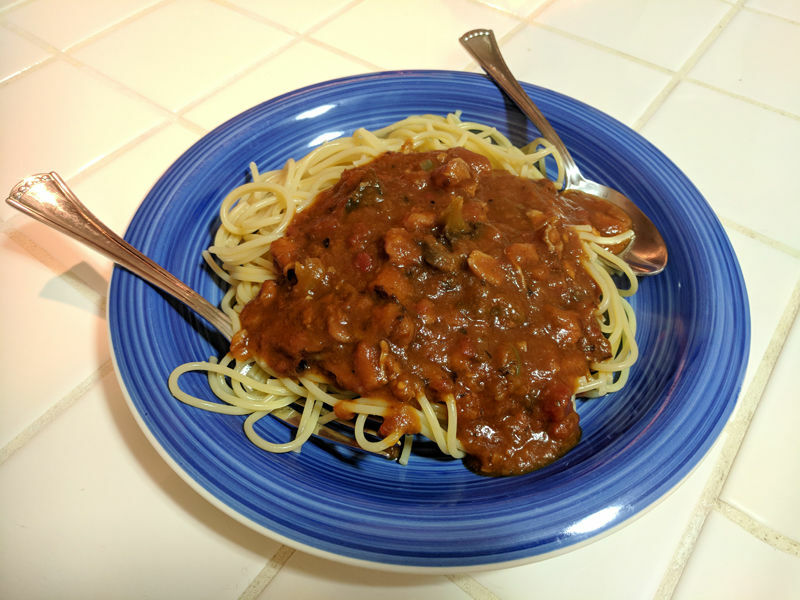 I tried simmering this sauce over night and completely destroyed it by both burning it and then mixing up the burned bottom into the rest of the sauce. Tip: If anything is burned to the bottom of the pot, do not scrape it off and mix it into the sauce. Leave the burned sections and gently remove the sauce from the pot without touching the burned sections. Discard the part burned to the pot. But if you've totally messed up and mixed in all the burned flavor into the rest of the sauce, it's still possible to save it. The miracle ingredient is peanut butter. I added 10oz of peanut butter to this large quantity of sauce I make and actually managed to save the sauce. It definitely tastes different, but it is totally edible. You might even like it. One of my friends actually really liked the peanut butter version. There is apparently a tomato sauce and peanut butter Filipino dish, so this isn't so strange after all. The peanut butter appears to blend into and disguise the burned flavor, somehow masking it. You end up tasting neither the peanut butter nor the burned flavor. Mix about 2-4 tablespoons of peanut butter into the sauce and taste after 20 minutes. Continue adding more peanut butter until it tastes just fine. You may need to add more red wine and sugar if bitterness arises.